DREAMING OF A TOP DEV JOB? YOU'VE COME TO THE RIGHT PLACE. We're here to help you ace your tech interviews. 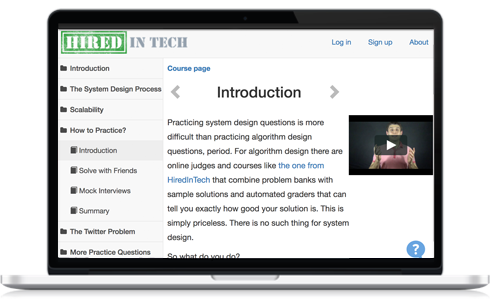 Master algorithm design, system design, and much more. Learn with theoretical lessons and practice tasks. Meet the Algorithm Design Canvas - our secret weapon to solving any algorithmic problem. Learn the fundamental theory of algorithms - all you will need on the interview. Use the most efficient way to practice. Learn our 4-step process to cracking any system design question. Master the principles of building scalable systems. Look under the hood of Instagram, Salesforce.com, and others to see how they serve millions of users every day. Put yourself in the shoes of the interviewer and see why many candidates are rejected even if they ace the coding problems. Avoid the 5 mistakes most people make and learn what else besides coding will get you hired.